First, it’s now one of the best-known public names in FinTech, and more specifically is new proof point that traditional financial services, such as credit, can be disrupted by a technology-focused startup. Second, the size of the offering and the amount raised – which was over $1B, since the underwriters exercised their full option for 8.7 million shares – put it among the largest US technology IPO’s in recent memory. This is significant since the scale both generated headlines and calls attention to category. Third, the business model: peer-to-peer (P2) or marketplace lending, is a key category for a range of players in FinTech, such as Prosper, OnDeck and SoFi. The business model has been explained sufficiently elsewhere, but the essence is that the Internet enables customers to borrow more cheaply than they might have using traditional sources. On the other side of the balance sheet, lenders (‘investors’) can receive a higher return for a fairly transparent amount of risk than they would otherwise. A win-win. On a personal note, as a San Francisco area resident, I was also glad to see the success of Lending Club as a validation of this new emerging category of business to be based here. Note: Lending Club was once based in Sunnyvale and Redwood City, moving to SF in 2011, so also constitutes an example of recent migration from Silicon Valley to SF. While one could certainly argue – and analyst coverage would definitely support this view – that Lending Club is a financial services company, to me the company is also very much a tech company for 3 reasons: origins, culture and vision. First, remember… this was literally one of the first apps you could use on Facebook! Further, the founders were not bankers, but rather included CEO Renaud Laplanche as a former the entrepreneur who had a successful exit, and then worked at Oracle). The culture is also typical of that at most technology companies, in terms of what’s seen as positive about working in tech, i.e. open and collaborative culture, non-hierarchial, focus on engineering, importance of product, and “quirkiness” (e.g. offices to encourage a sense of play and collaboration). In terms of culture, Glassdoor gives Lending Club gets a 4.6 / 5 star rating. Just compare that to traditional banks like Morgan Stanley, where it’s about 3.5: Lending Club gets ratings more like a well-run tech company or startup. More importantly, the vision. As John Battelle said this fall at NewCo Silicon Valley’s kick off event at Survey Monkey’s HQ, the latest crop of tech firms based are looking more than just to make money – they want to change the world, or at least improve something that is broken. 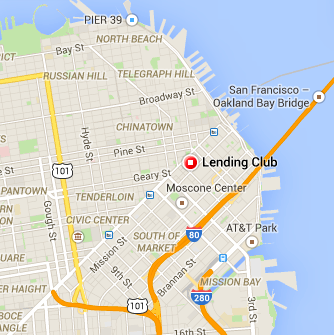 Lending Club definitely has that vision. In fact, it was born of the founder’s frustration that typical credit card rates were 18%, which seemed altogether too high to him, so he envisioned a way to match borrowers and lenders directly. There’s obviously much more to it, but the best business idea also has a simple “story” to it, and clearly this is true for Lending Club. This blog does not provide investment advice, so I’m not going to provide a view of their valuation, but I applaud their success. CEO Renaud Laplanche is not someone I know, but connected with when I when I moved to San Francisco, as a fellow graduate of London Business School. It’s good to see a fellow graduate succeed, especially when these days an MBA carries less weight than being a full stack engineer. The world needs both! From my experience in launching new products at established banks and startups, Lending Club provides a compelling example of how to embrace the value of technology in a really smart way, and deliver value to several market participants. And the timing couldn’t be better. The IPO market is back on track in 2014, with recent successful IPO of Alibaba earlier this fall. Just today, another, albeit smaller marketplace lender, OnDeck focused on small business lending, went public. Well done, Lending Club – here’s hoping many other FinTech firms will find similar success, rewarding entrepreneurship and risk-taking, and hopefully providing a push towards innovation among the larger financial services companies, as well as a shift in the corporate cultures of banks – both here in the US and around the world – towards a more inclusive, collaborative culture. Welcome news, and a model to emulate….. it takes more than just ping pong tables and pet-friendly environment! Posted on December 18, 2014 January 8, 2015 by Michael Halloran	This entry was posted in Uncategorized and tagged FinTech, Lending Club, OnDeck, Prosper, SoFi. Bookmark the permalink.